The concept of free distributing e-book is come from bloggers, many professional bloggers are doing this to get more traffic and then making the traffic into life time visitors to increase the ranking of the blog and revenue also. You can do the same, may be you are thinking it is quiet tough and these that, but let me remind you one thing "Nothing is Impossible", you can do it, it's simple. Here are few things I am going to share with you which will really open your eyes for forever, one thing you can say, this is a gateway to become a professional blogger. What would you write in your e-book, is the main question generally blowing in your mind right, so here is the answer, write every thing which will helpful for your visitors, I think you should write which is related to your blog. That's why people will come to your blog every day, yes every day, if you wanna become a professional blogger then you have to do it. 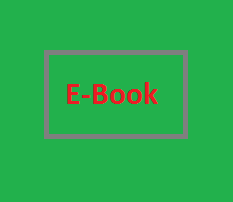 Even I am providing an free e-book for first blog www.engineeringinstitute.in, I am not providing any free e-book in this blog because still I have to write about few more articles then after I will provide e-book which will have complete blogging solution for blogspot bloggers. Actually there are every one who wants to utilize their time, suppose if some one is downloading your e-book then definitely he or she wants to utilize their time for reading your e-book. So write e-book which is really having quality tips for your readers that's why they will get great value for reading your e-book then only they will read your blog and also may be they will recommend others to read your blog. And remember recommendation is the best thing in any service and people do recommend others to do any thing, if they found something great for them. One more thing don't forget to do proof reading of your e-book before publishing it. When I have started blogging in that time I did not know about blog, forget blogging, but now as a Mechanical Engineer, I know about SEO for blogspot blog even I am doing it for my blogs. Actually I am talking about length of the e-book, I think your e-book must not have more 50 pages because this is my personal experience those e-book are more lengthy I did not read them because it is too time taking but some times it is helpful but not every time. For this service, I would recommend you to use Mediafire.com, reasons are simple because it's free, provide great service to download file with super fast speed. "Now Let's Talk About Benefits of Creating E-book and Distributing for Free"
After getting benefits from your e-book people will subscribes your email feed and also they will subscribes on Social Media. Indirectly it will happen when people will come to your blog more often, then definitely your earning will increasing from your blog, but how you can make more money from the e-book. Feed affiliate link to the e-book related to your e-book topic and then see the money coming to your account. In blogging or in a business relationship with customers is every thing, this is the great way to make a great relationship with your blog readers and blogging is a perfect business take it seriously it will change will life. Give away something amazing, I mean what best you can give to your readers and in the beginning e-book is just great. Branding is always work in the market, your e-book alone can do this, so don't forget to provide quality contents in the e-book, once you will make your blog more famous, you can do any thing in your life, just blogging is the best way to live your life in the better way, that's why bloggers is increasing day to day. Have professional template, logo. Hire someone to do it for you, that would be much better if you have small budget and may be you are new to blogging world then let me know I have many those can do all these works for you in very affordable price according to your requirement. Respond to all those are commenting, sending message on Facebook, sending e-mail to your for anything, may be for any query, may be thank you message and may be fan message. Advertise, guest blogging, telling others about your blog (mouth to mouth), having facebook fan page and others social media pages too can increase your social reach which means authority as well as reputation will increase thus branding. There are search engines to give you back up for getting organic traffic but what about referral and direct traffic, remember direct traffic always stay more time in a blog, so what does that means your blog rank will increase. In blogging visitors is everything, do everything which make your visitors to stay on your blog more time. Next is write more and more articles with quality, don't forget to update your blog daily, provide each and everything through your blog, what people are looking for from the internet. Remember if you are doing hard work to get anything then definitely you will get more value from it, because every one can not do the same, that's why people will like you. Note:- Never give up blogging, today or tomorrow, the day will definitely come. In that day people will talk about your blog and you. See I am saying after getting experience in it and before implementing this tip I have seen there are almost all pro bloggers are doing it and there is only one reason behind it, because they are getting benefit from it. So, its your turn to get benefit from this system.